Summers usually give us hordes of mindless action movies, the kind of movies where you can put your brain on hold. So far we've seen The Lost World: Jurassic Park and Con Air, and looming on the horizon are Batman and Robin and Men in Black. So when a small, quiet movie like Ulee's Gold comes along, it's quite a surprise. In most places in the country, you won't find it competing against the blockbusters in mega theater complexes. Instead you'll find it tucked away in art houses and other off-the-beaten-path theaters. And that's unfortunate because Ulee's Gold may very well be the finest movie of this summer. And it deserves to find a larger audience. Peter Fonda in Ulee's Gold. Like Sling Blade, another quiet movie that focused on simple, everyday life, Ulee's Gold doesn't contain any big special effects or action scenes. You won't find any pyrotechnics or digitized creatures. Instead you'll get a relatively rare commodity: finely drawn human characters. And that's what makes this movie so special. Ulee's Gold, the premiere movie at the Sundance Film Festival in 1997, takes a situation that could have become standard Hollywood action movie material: a war veteran takes on a couple of young hoods who are holding his daughter-in-law as hostage. It's easy to imagine Hollywood's take on the subject, with Kevin Costner or Harrison Ford playing a dull but introspective lead character who straps on a couple of .45s and goes into battle to save his family. But, no, director Victor Nunez isn't interested in that route. Nunez keeps the focus on the people instead of the action, and in the process we see how deeply everyone is affected. 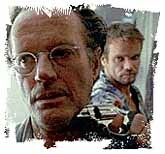 Ulee (Peter Fonda) gets acquainted with Eddie (Steven Flynn) in Ulee's Gold. 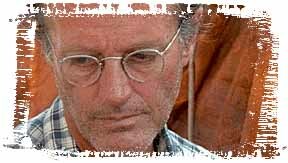 Peter Fonda plays Ulee Jackson, a bee keeper in the tupelo marshes of the Florida panhandle, and it's the performance of his career, a performance that will have you recalling the quiet, understated dignity of his father, Henry Fonda. Ulee has a solitary life. He rarely has to talk to anyone. And he likes it that way. Nunez's camera focuses on Ulee as he goes about his normal daily chores, handling the hives, mending broken wooden crates, and moving barrels of honey. The irony becomes clear--Ulee possesses the patience of Job with his bees, but with his own family, he can be hard and firm. In one scene he gently shakes a tree branch to drop a swarm of bees back into its hive ("The bees and I have an understanding. I take care of them and they take care of me. "), but in another scene he chases his granddaughter out of the front door of their house, yelling at her to be home by 11 o'clock. When he talks to his son, he says, "At the rate she's going she'll be starting a baby even before you and Helen did. One round of fools is enough."). Ulee isn't terribly comfortable around people and no doubt prefers his bees and the danger they pose to the uncertainty of relationships with people. But he can't remain isolated forever. One day his son calls from prison and asks Ulee for a favor. He wants Ulee to follow up on a story he has heard about his wife (Ulee's daughter-in-law) being help captive by two no-good thugs that Jimmy used to run around with. At first Ulee wants nothing to do with Jimmy's wife and refuses to be involved, but eventually he relents and sets off in search of his daughter-in-law. Penny (Vanessa Zima) and her mother (Christine Dunford) in Ulee's Gold. As in Sling Blade, the threat of violence hangs over the movie and supplies an ongoing sense of suspense. Even while we watch Ulee simply caring for the hives as he strives to bring in a load of rare tupelo honey, the threat of violence gives the small actions a special brand of resonance, a more finely honed sense of being, as if every action now has greater importance because it could be the last for Ulee and his family. And the omnipresent threat of bee stinger against naked flesh also adds an element of caution to many scenes. I don't know if I've ever been in a quieter theater than when Ulee was harvesting honey. When the movie starts, Ulee confidently spews out his law to his family, but once he is thrown into the role of restoring the family, he begins to see how complicated life can be. He either can be a hard man and allow his family to continue falling apart or he can become malleable and save his family: "I'm just realizing I don't know enough about anything to say nothing," he says. "I've forgotten how to deal with new things . . . you know, new feelings, new people." But like his namesake, Ulysses (of Homer's The Odyssey), Ulee is on a voyage home. Physically, he has been at home, but emotionally he has been far removed. Ulee's Gold takes us on a poignant and emotional journey as Ulee reclaims his family and restores his life. Director Victor Nunez is slowly emerging as one of the most interesting filmmakers in America. His Ruby in Paradise (1993) starring Ashley Judd gave us an insightful portrait of a young southern woman's personal struggles. (His other movies include A Flash of Green with Ed Harris and Gal Young 'Un, 1984 and 1979 respectively.) His style of filmmaking eschews the razzle dazzle of Hollywood filmmaking and focuses completely on the main characters and how they survive. This quiet, gentle approach to filmmaking reveals his own intense fascination with people and how to tell stories about characters we might otherwise pass right by without noticing. His keen observation of everyday life is remarkable and Ulee's Gold is a marvelous movie.